Round 4: Jack kicks a small bag Highlights of Jack Riewoldt's Round 4 match against Brisbane. Star Richmond key forward Jack Riewoldt was the top vote-getter in the AFL Coaches Association’s Player of the Year award for the Round 4 match between the Tigers and Brisbane at the Gabba. 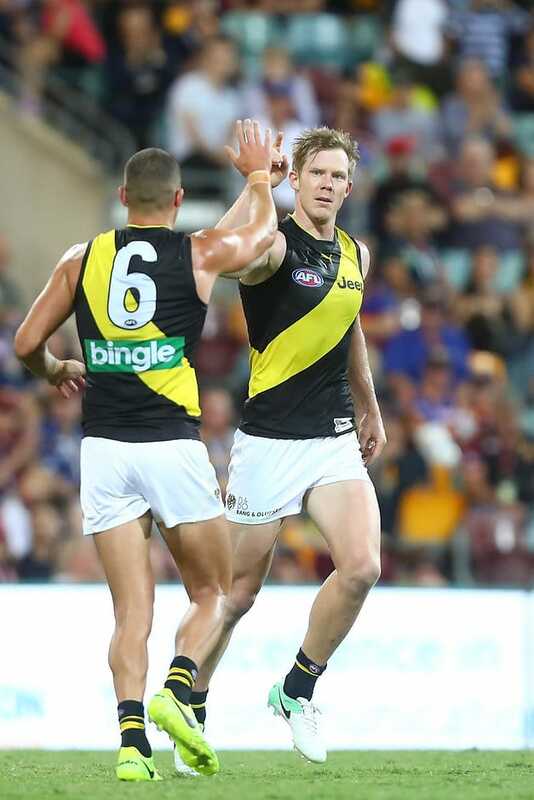 Riewoldt received eight votes from respective coaches Damien Hardwick (Richmond) and Chris Fagan (Brisbane) following his top-class display in the Tigers’ 52-point win. He collected 15 disposals, including nine contested possessions, took a team-high eight marks (six of them inside 50), had eight score involvements and kicked an equal game-high four goals. Hard-running Richmond midfielder Shaun Grigg picked up five votes after finishing with a team-high 31 disposals, including a game-high 11 score involvements, game-high nine inside-50s, game-high four goal assists, team-high three centre clearances, plus six marks, four tackles and a team-high 586 metres gained. Lively, young Tiger small forward Jason Castagna was awarded four votes for his eye-catching performance of 16 disposals, including seven inside-50s, six marks (four of them inside 50) and four goals. The other Richmond player to feature in the Round 4 coaches votes was key defender David Astbury, who polled three. Astbury had 16 disposals, including seven contested possessions and an equal team-high five rebound-50s, along with a game-high 11 intercepts and five marks. Full voting details for the Round 4 Richmond v Brisbane match are . . .